In honor of my favorite day of the week, I bring you The Friday Five. Every Friday I will ask the same five questions to myself, or any other willing participant! All my fellow book lovers are welcome to join in on the fun. Why did you choose this book? I recently watched a re-run of Killer Hair on the Lifetime channel and felt the urge to delve into another Lacey Smithsonian adventure. And really, how could I turn away from a mystery revolving around a cursed shawl? Plus Stella’s getting hitched, which means lots and lots of outrageous fashions and melodrama galore! Where did the author go right? Or if it’s a turkey, what went wrong? Like going to my favorite hamburger joint in a city full of restaurants, I know without a doubt that any book by Ellen Byerrum is a surefire winner. It’s like she studied me and figured out how to blend all of my most favorite elements into a book series: Quirky gal pals, vintage fashions, a headstrong reporter sleuth, and just a dash of romance. As a journalist, I tend to be a little biased toward my fellow newshounds, which must be why I’m rather fond of Lacey. But there are many other reasons why she stands out among the many amateur sleuths on my bookshelves. She’s fiercely devoted to her friends, and she’s got this mysterious connection to her aunt Mimi. Although Mimi is long gone, she still gives comfort to Lacey through the treasure trove of vintage fashions she left behind in her trunk. Wouldn’t it be fun if the author wrote a spinoff about the enigmatic Aunt Mimi? Perhaps she was a fashionable amateur sleuth back in the 1940s! Did anything bug you about the book? Ugh, yes! Stella’s sanctimonious new-agey mother totally bugged me. I almost threw my book against the wall when she threatened to torch Stella’s pretty princess wedding gown in a “cleansing ritual.” Oh and while I’m at it, I’m also really annoyed that the Lifetime channel didn’t continue on with the series. Go here to read more about my thoughts on the books vs. TV series. Dear Lifetime Channel, please reinstate the Crimes of Fashion series. I miss these ladies! Would you read another book by this author? Absolutely! I’ve been reading this series out of order, so I have a lot of catching up to do. How would you sum up the book in three words? Hilarious, witty, suspenseful. 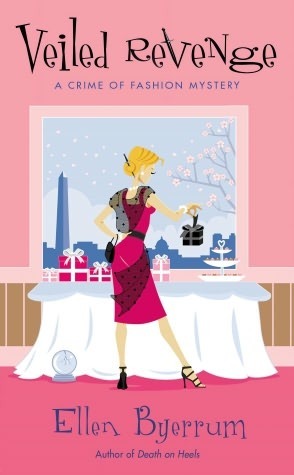 Posted on August 10, 2013 by Bubble Bubble Books and Trouble •	This entry was posted in Features, Friday Five, Mysteries and tagged chick lit mysteries, Crimes of Fashions, Ellen Byerrum, Lacey Smithsonian. Bookmark the permalink.